There’s something very comforting about casseroles to me. I’ll admit I don’t make them as often as I use to because we’re empty nesters and one casserole would last us all week (I do enjoy a little variety in my meals!). But when I do make a casserole, I’ll make something yummy with lots of melted cheese like this Mexican Taco Casserole. Casseroles are also great to make and freeze for later…like now, while I’m in Australia this entire month. I’ve wrapped a few portions of this taco casserole up for my hubby to eat while I’m gone. Have you noticed all the “big batch” food recipes this month like Pumpkin Mac ‘n Cheese and Spaghetti Sauce? That’s because I made them all in September before I left so I’d have recipes to share this month and so my husband could eat while I was gone. How’s that for thinking ahead? You might remember I made a bunch of homemade tortillas a while back. When I make homemade tortillas, I make a lot. This taco casserole is a great dish to make using up some of those tortillas! 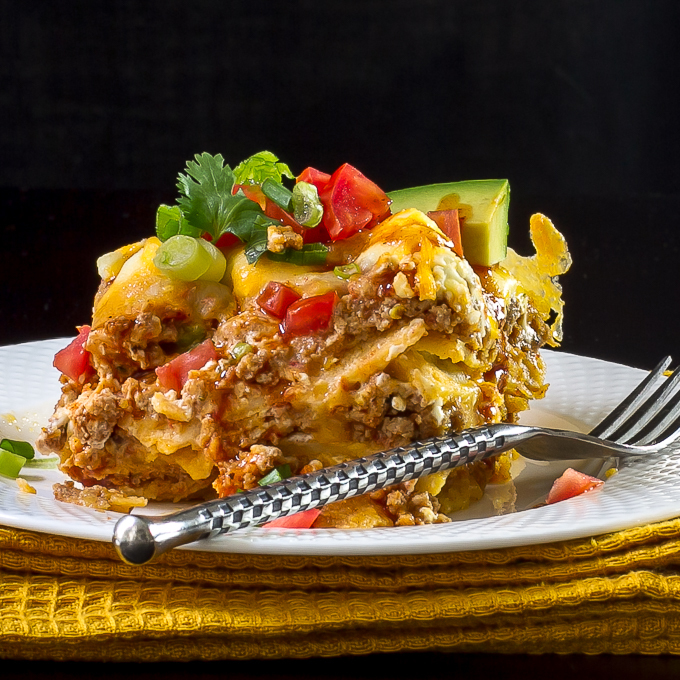 The best thing about this Mexican Taco Casserole is it’s such a versatile dish to make. You can add more ingredients or less, depending on your family’s taste preferences. I had originally planned on adding a can of black beans this time around and after I started assembling the casserole I realized I forgot the beans! Another senior moment! But that’s what’s so great about casseroles…you can add whatever you want. This would also be delicious with sliced black olives, or even corn. If you don’t have a jalapeño, try adding a can of chopped green chiles. Just think of your favorite taco ingredients and add them to it. But don’t add all your favorite taco ingredients in the casserole. Some are better added on top, after it’s cooked. Sliced avocados, chopped fresh tomatoes, perhaps some green onions…all good choices. Want it a little spicier? Add a couple shakes of your favorite hot sauce. If you like sour cream, add a dollop on your portion. I usually do but didn’t have any sour cream in the fridge this time around. 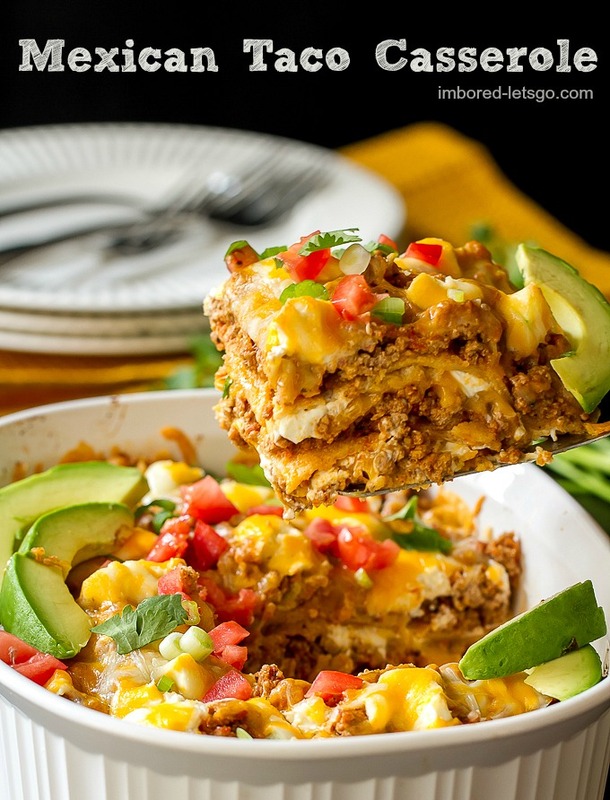 Any way you make it, this Mexican Taco Casserole is comfort food at it’s best. In large skillet, brown turkey with diced onions, garlic, and jalapeño. Season with cumin and chile powder. Add tomatoes and simmer about 10 minutes for flavors to combine. I like to puree one can of tomatoes and keep one can of them diced for some chunks. Add cilantro and stir to combine. In large casserole, alternate layers of tortillas, meat mixture, cream cheese and cheddar. Bake in oven about 20 minutes, until hot and bubbly. Top each serving with desired toppings. *This recipe isn't too spicy so I like to add Chipotle Cholula Sauce to spice mine up a bit. If you like spicier food, add your favorite taco sauce on top! Southern California comfort food at its best! Love the pictures! I haven’t made a casserole in forever, maybe it’s time. 🙂 Hope you’re having a wonderful time down under!! Born and bred in the Southwest of the States and have been cooking this for 33 yrs. We call it Enchilada casserole and love every version of this dish try the green chile chicken enchilada version Wonderful! Pansa llena corazon contento!! I was born and raised in SoCal… love, love, love Mexican food! I thought about calling this Enchilada Casserole but since I didn’t use enchilada sauce it seemed more like taco casserole 🙂 So yummy though, isn’t it? Thanks for stopping by and commenting! Thanks Ihjaz, I hope you enjoy it! How do add the cream cheese, just drop chunks? 350 degrees… thanks for pointing that out. Going to add that now! What size dish was this baked in? The dish I used (in the picture) says 2.8 liter on the bottom…measures about 10x7x3 inches. Hope that helps! Going to make this tonight! Do you think cooked spinach would be good mixed throughout the dish? I’m also considering puttimg black beans in it! Sorry I just saw this comment, hope it’s not too late. Did you put spinach in it? Or black beans? It’s one of those recipes you can toss in whatever makes you happy! One more, how many tortilla shells per layer? Oh gosh, I honestly don’t remember! I’m horrible with details, so sorry. But just make it like you would a lasagna. Overlap the tortillas a bit. It doesn’t have to be perfect. My dish is oval so I probably even tore some up to fill in the curved parts, if that makes sense. Very good! I added 2 cans of black beans washed and drained to the meat mixture and also some rice. Will definitely make again. Glad you liked it! I always thought black beans would be great in this, didn’t think about rice though…yum! I’m like you…I could eat Mexican food everyday too! Except then I wouldn’t be able to have my other favorite food – Thai 🙂 I’ll go check out your recipe! Do I drain the tomatoes first? Thanks! No, I don’t but I pureed one can of them. hi! I can’t wait to make this but have 1 concern/question, the tortillas are they soft? And do they get soggy? Should I crisp them up first? Thanks!! I am so excited to make this. I am using chicken instead of ground turkey and I will also add black beans. Sounds great…it’s a flexible recipe. Enjoy! What exactly do you do with the cream cheese and cheddar? Do you mix them together?? Making this tonight! Thanks! I just broke up the cream cheese into pieces and scattered them and sprinkle the cheddar over as well. Hope you enjoy this!!! How many servings did your dish make? Not sure exactly but the casserole dish I used (in the picture) says 2.8 liter on the bottom and measures about 10x7x3 inches. Is there a healthier option besides the cream cheese? I will use greek yogurt instead of sour cream but not sure of a replacement for the cream cheese ! Thank you !!! I guess you could use a lower fat version of cream cheese! Can you use flour tortillas instead of corn? Also instead of the tomato’s could you use a chunky salsa? You can change this up any way you like! I’ve never tried it with flour tortillas, but I’m sure it would be fine…might have a different texture and salsa would be delicious! Let me know what you think if you try it. We absolutely loved this. I used 1/2 ground pork and 1/2 ground beef. I also used a medium heat chunky salsa instead of the tomatoes and flour tortillas instead of corn. I added Spanish rice and black beans. The only thing that I will change next will be to add the cream cheese to the meat mixture in the pot and let it melt in with it. My son told me that this was a keeper and that is high praise. I don’t know why you couldn’t… I have never tried freezing it so I can’t say for sure but I think it would be just like freezing any other type of casserole.